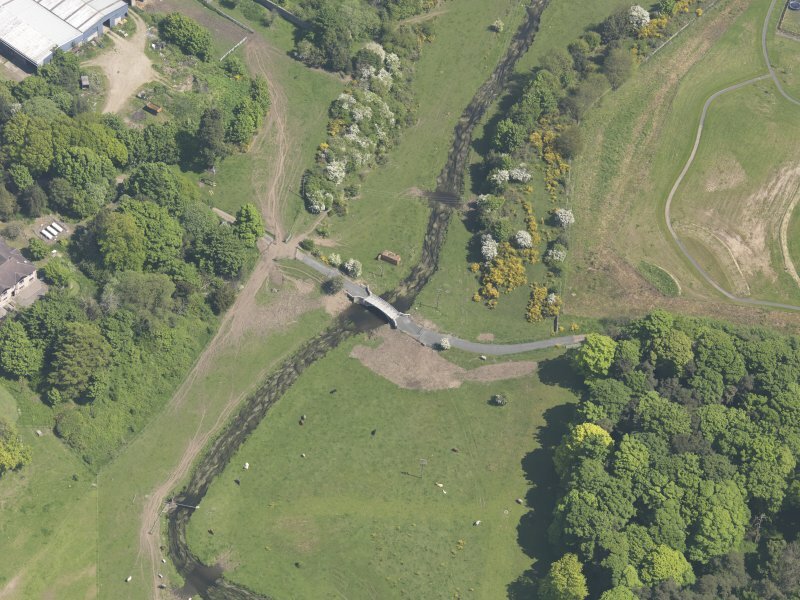 Oblique aerial view of Linlathen House East Bridge, taken from the ENE. 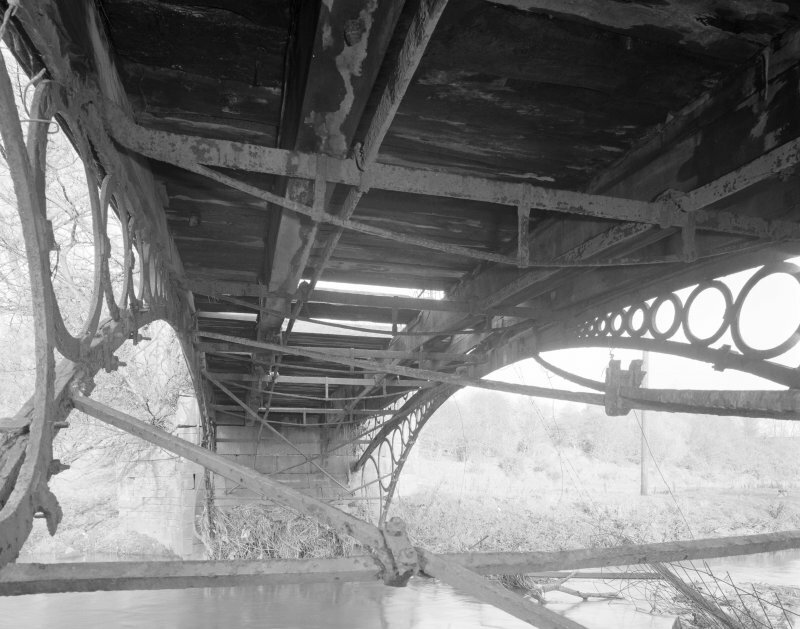 Oblique aerial view of Linlathen House East Bridge, taken from the SW.
Linlathen East Bridge View of bridge from SW, showing spandrels formed by row of diminishing iron circles. 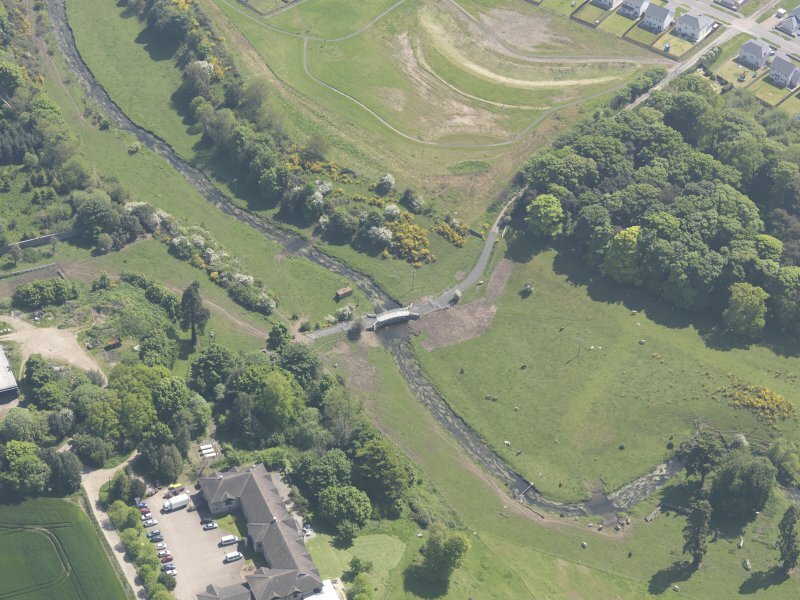 Oblique aerial view of Linlathen House East Bridge, taken from the E.
Oblique aerial view of Linlathen House East Bridge, taken from the SE. 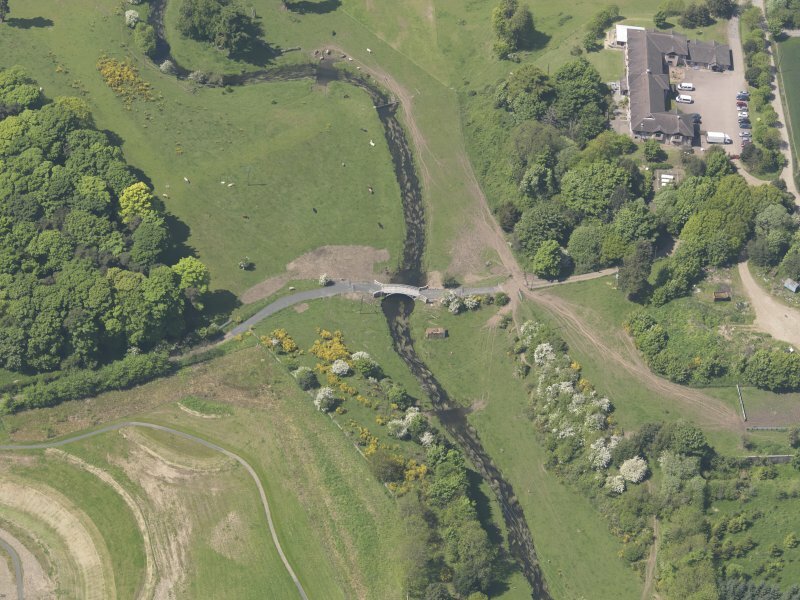 Oblique aerial view of Linlathen House East Bridge, taken from the W.
Photographic copy of drawing. 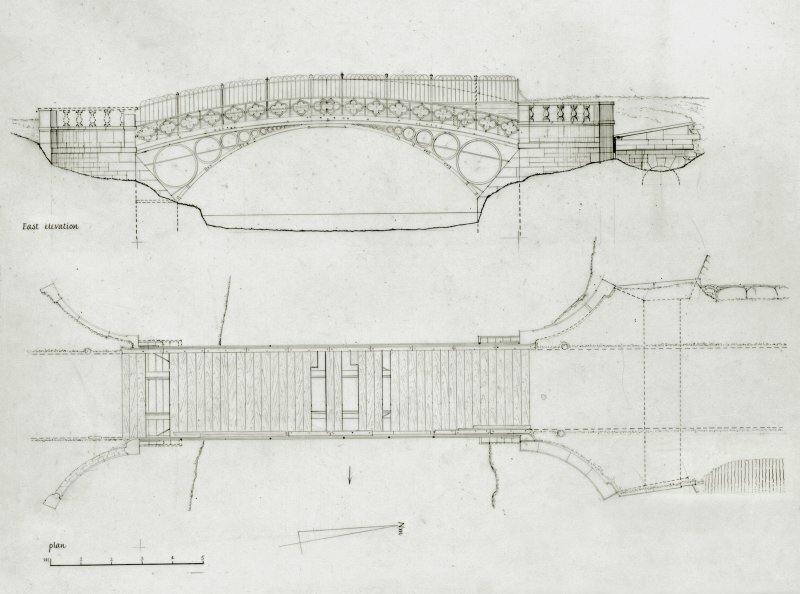 Elevation and plan of Linlathen East Bridge. Formerly entered as NO43SE 88 at cited location NO 46394 32855. 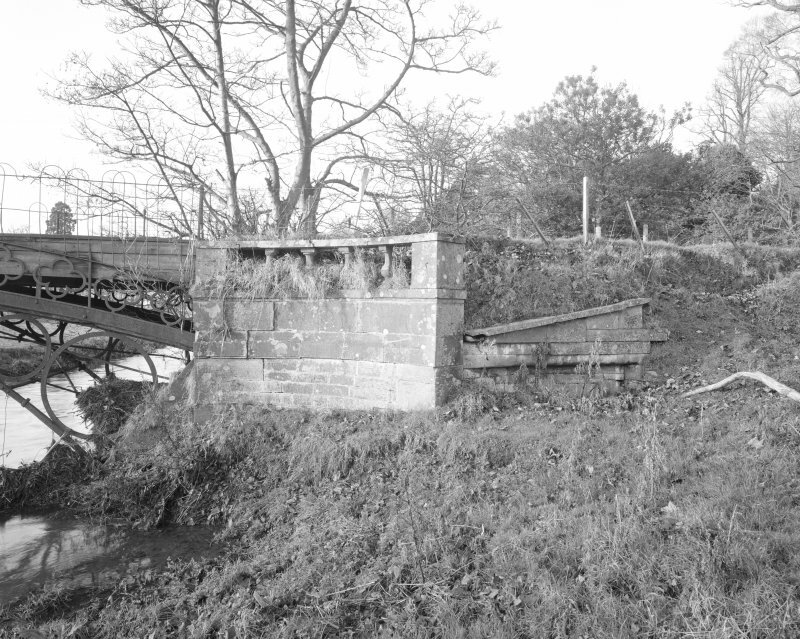 Not to be confused with West Bridge (also over Dighty Water, at NO 46039 32702), for which see NO43SE 18.02. 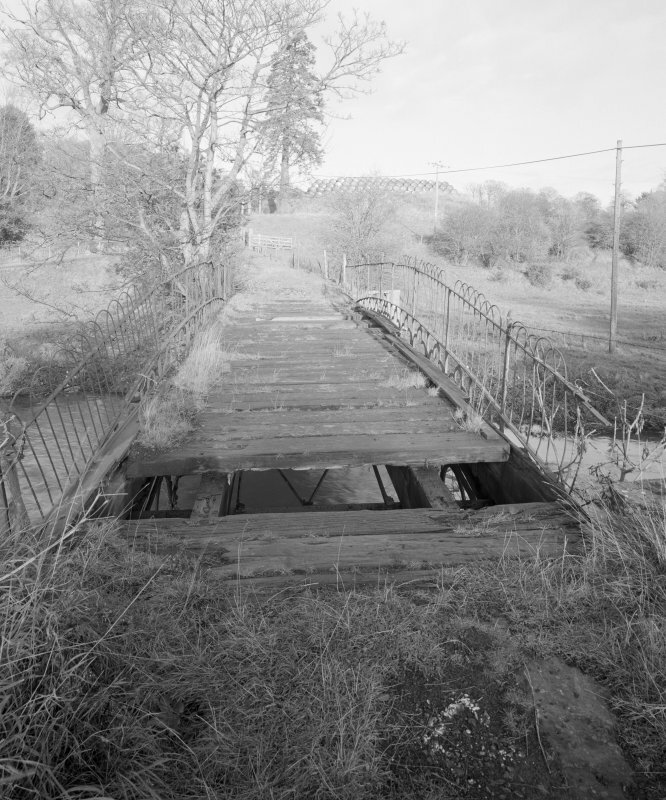 At the time of the RCAHMS photographic survey, conducted during November 1998, the condition of the bridge was very poor and was rapidly decaying. Visited by RCAHMS (MKO), April 1998. 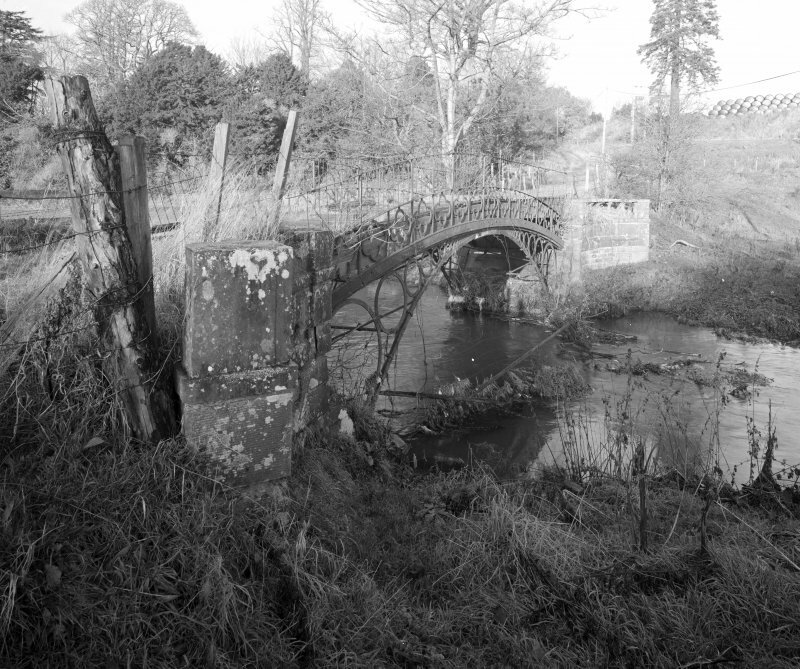 This bridge carries the eastern approach drive to Linlathen House (NO43SE 18.00) across the Dighty Water to the S of the House. It is depicted, but not noted, on the 1994 edition of the OS 1:10,000 map. The location assigned to this record indicates the apparent midpoint of the structure. The available map evidence indicates that it extends from NO c. 46394 32844 to NO c. 46395 32858. 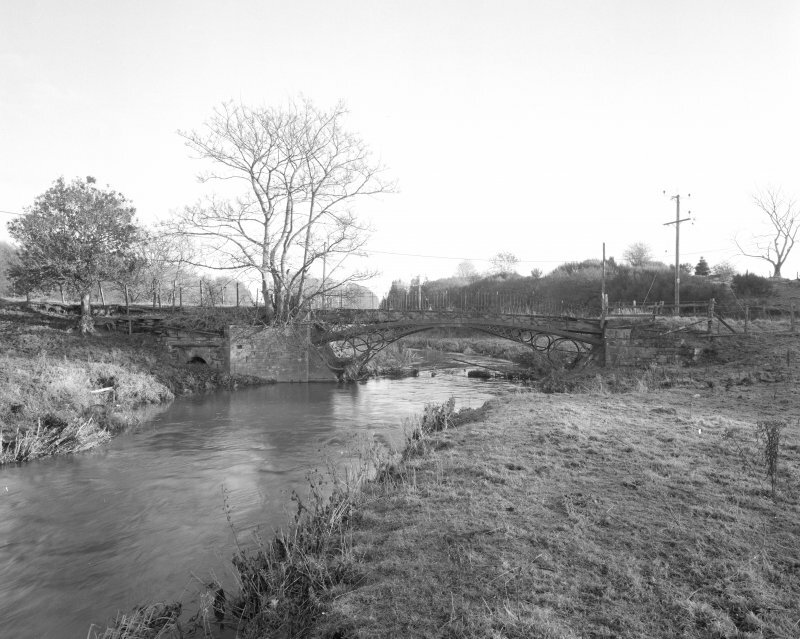 This bridge dates from the early decades of the 19th century ca.1804 or soon afterwards which, if confirmed, would make it Scotland’s earliest surviving iron bridge. 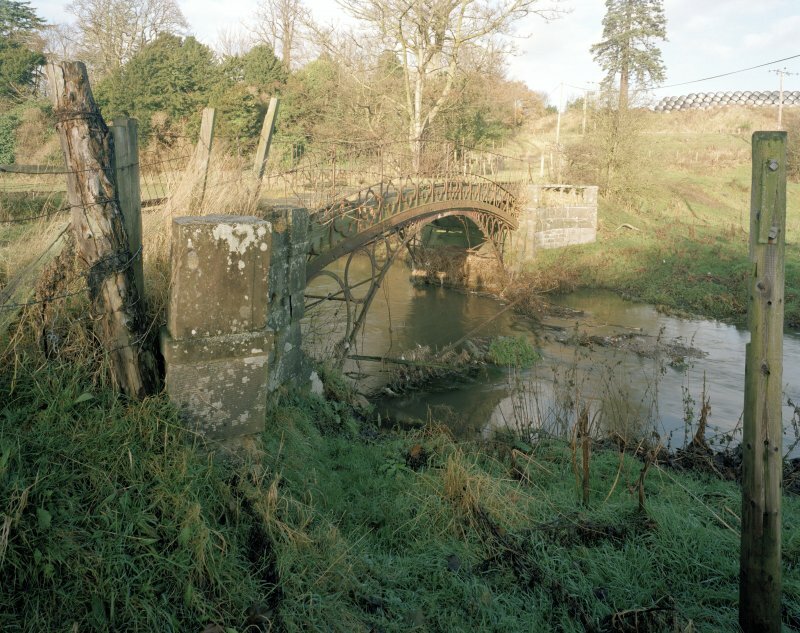 This historic cast- and wrought-iron arch bridge, 9 ft wide and with a clear span of 35 ft carrying an estate road over the Dighty, dates from the early decades of the 19th century ca.1804 or soon afterwards which, if confirmed, would make it Scotland’s earliest surviving iron bridge. 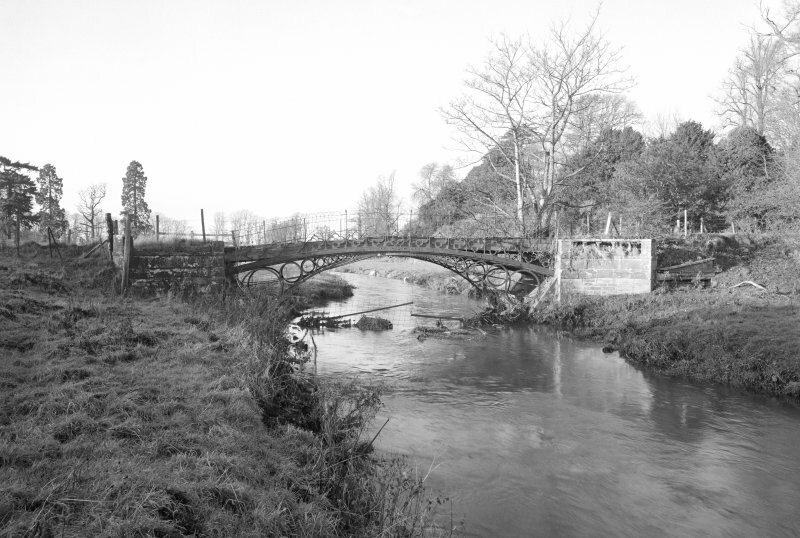 The designer and maker are now unknown, but the structure’s origins are almost certainly Dundonian. 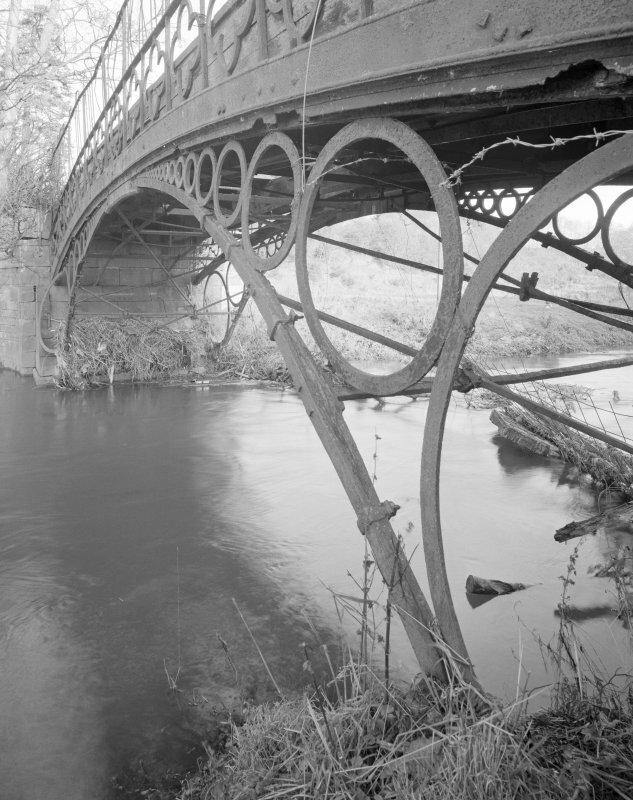 The circles in its spandrels were probably influenced by the elevation of Sunderland Bridge (1796). 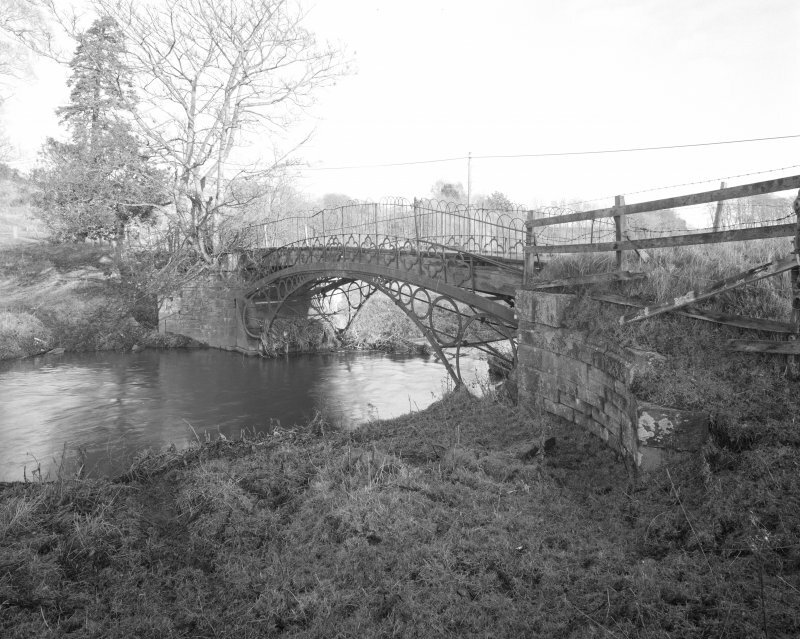 The bridge was a bold effort for its time with hand-crafted, substantially unique ironwork, including transverse trusses carrying intermediate bearers supporting timber deck beams. 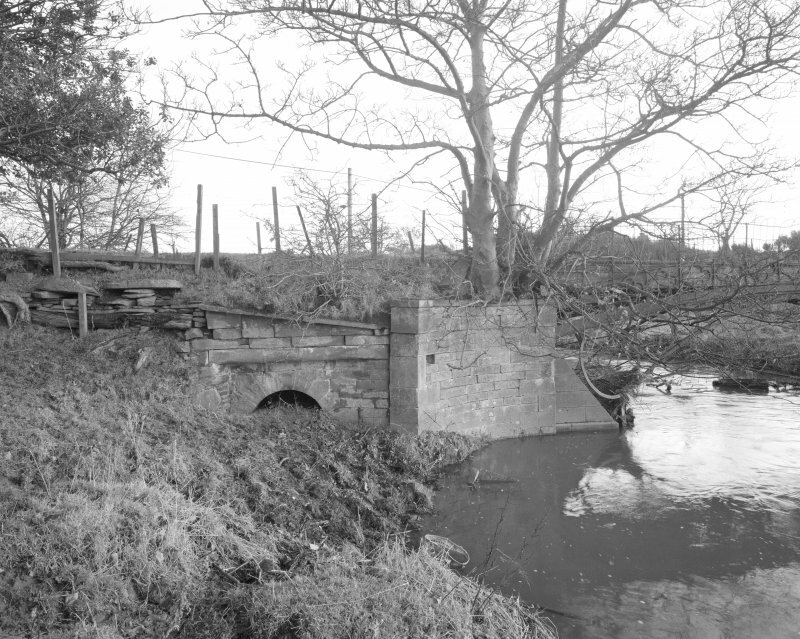 The crude strengthening of the bridge for farm use last century with deep timber beams from the crown to heightened abutments has resulted in the roadway on the north being lifted above the balustrades. 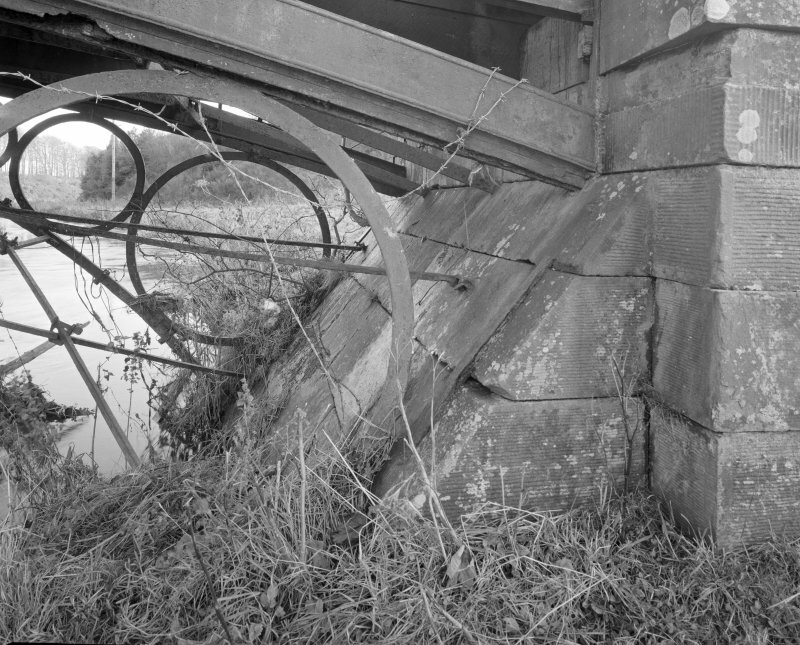 The original elevation is shown dotted on the parapet line in the elevation. 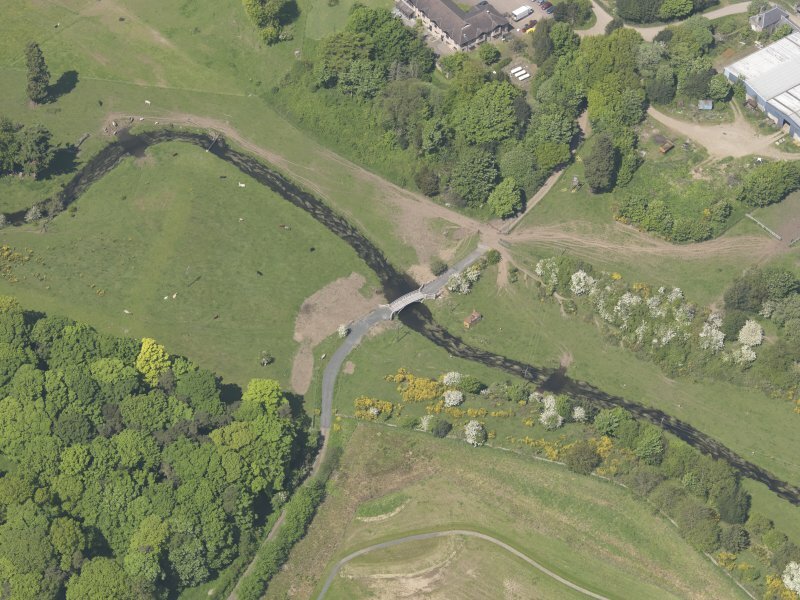 The land arch may have been for a mill lade. 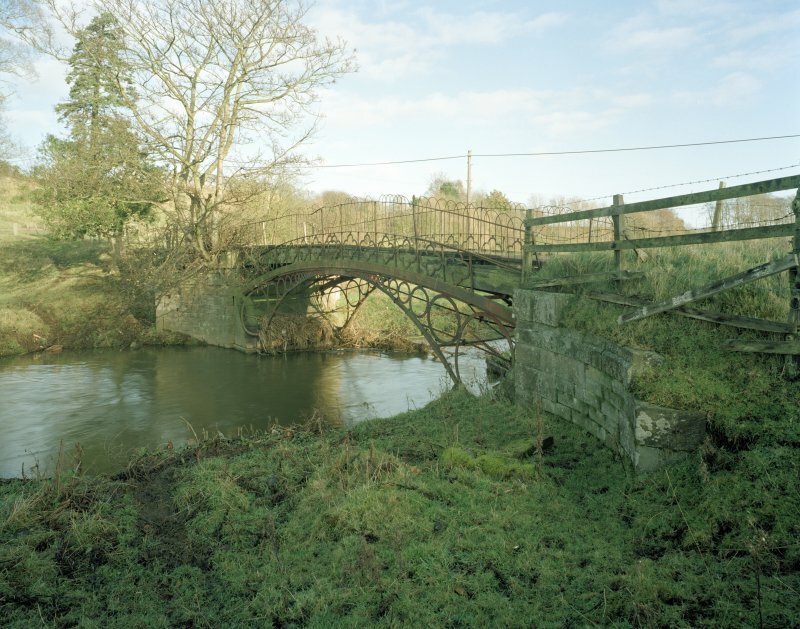 The bridge is now closed because of its poor state but is worthy of being preserved. Its main members appear to be intact. 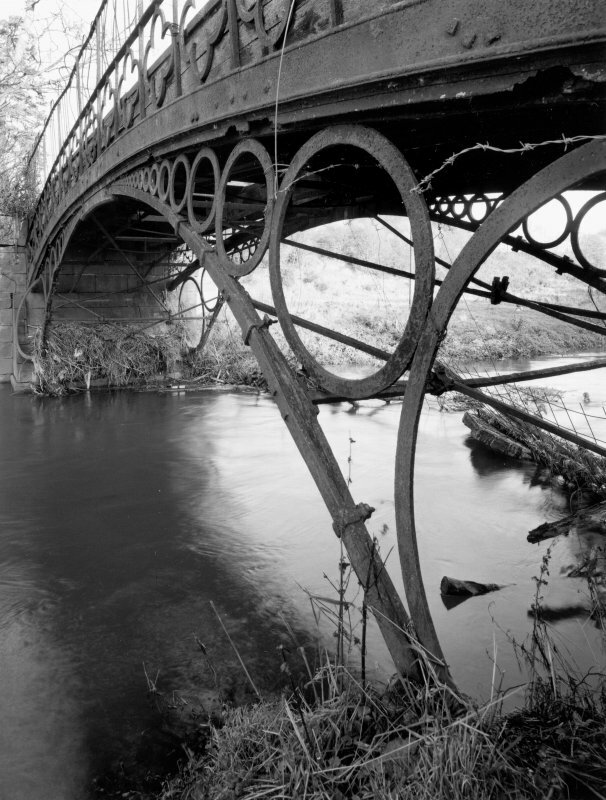 Fortunately, after expressions of interest in conserving the bridge by the Dundee Civic Trust, Broughty Ferry Community Council and others, with support from PHEW [Panel for Historic Engineering Works], the Dundee City Council has now made its conservation a condition of planning consent for adjoining residential development and hopefully the bridge will soon be authentically restored to its former glory. 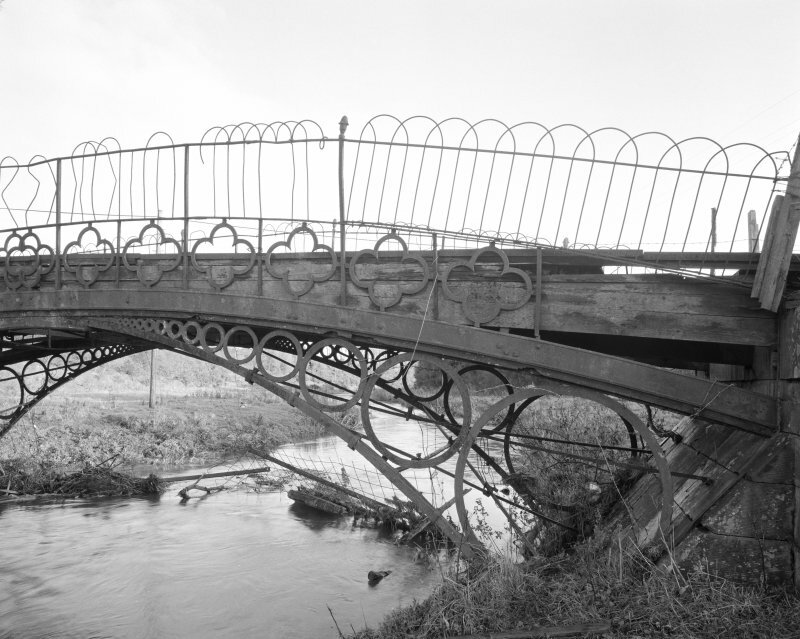 This 1840-50 cast iron bridge has a cast iron balustraded parapet and four ribs each of two castings. 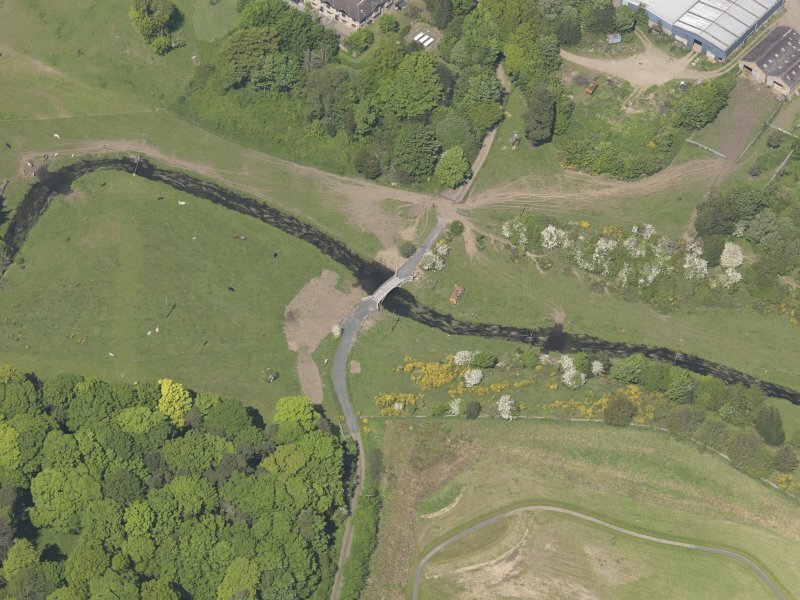 The roadway is level and placed so as to meander through the landscape, curving round to achieve access to Linlathen House, so differing in two respects from its predecessor, the East Bridge.